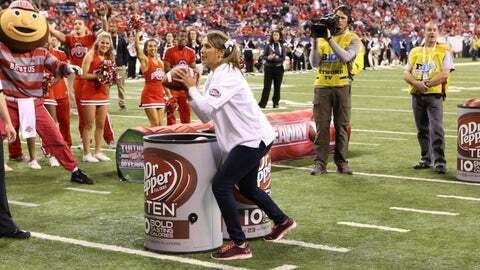 Molly Brown tosses footballs at a target in an effort to win a $100,000 college scholarship from Dr. Pepper. CANTON, Ohio – If Molly Brown’s 15 minutes of fame are almost up, the Walsh University sophomore is fine with it. She could use a nap. And she’s enjoyed every second. At last Saturday’s Big Ten Championship Game, Brown won $100,000 of scholarship money in Dr. Pepper’s Tuition Giveaway program by throwing footballs — two-handed — through a large target dressed as a Dr. Pepper can. She’d gotten there by submitting a video that asks students to tell Dr. Pepper "how you’d like to make an impact on the world," and after submission and two rounds of voting, she got a call in late November that she’d be flown to Indianapolis for the game and the chance to throw 30 footballs in 30 seconds through the can from five yards away. The former basketball and volleyball player from Louisville, Ohio, was the runaway winner in the final, earning a live interview on FOX during the Big Ten Championship Game and a large — in stature and significance — check from Dr. Pepper that was too big to fit in her suitcase on the flight home Sunday. So, she carried it with her. And people in the Indianapolis Airport who’d seen her the night before were asking her to pose for pictures. On Monday, she did one interview with a Cleveland TV station and two with Canton radio stations. That’s in addition to her time just after the contest trending worldwide on Twitter and a late Saturday night celebration that included players from Michigan State’s newly-crowned Big Ten Championship team asking her if they could pose for a picture, not the other way around. I really am out of ways to describe it. The whole thing was just incredible. Guys, if you’re one of the maybe one hundred (maybe more) who used social media to ask Molly on a date or even propose marriage, she’s not necessarily saying no (yet). She is saying she probably hasn’t gotten to your message. "I got so many messages," she said. "An overwhelming number. My phone wouldn’t stop vibrating, and it was blowing up with Facebook friend requests. "I haven’t gotten back to anybody yet." Her phone broke on Thursday during her trip to Indianapolis, and though she secured a new one there she didn’t know her Twitter password until she could get home and find where she’d stored it away. That’s a major first-world problem these days, but it was about the only bump in the road during a weekend Brown said she’ll never forget. "I really am out of ways to describe it," she said. "The whole thing was just incredible." Brown is in a four-year nursing program at Walsh, and she’s already considering a post-graduate nurse practitioner’s program. She’s been paying her own way through school and using student loans, and she says the rest of her undergraduate career will now be paid for by Dr. Pepper. Besides growing up in a football-crazed town just east of Canton, Brown played in a powder-puff football tournament at the Cleveland Browns training facility during her senior year in high school. She said she was a receiver because "I can’t throw it that well." The two-hand push method of throwing the ball that won her $100,000 was borne out of necessity and polished by "many hours" of practice. She was guaranteed $2,500 and the weekend trip to Indianapolis just for having her video — she explained that she’s putting herself through college so one day she can help heal sick kids — deemed strong enough to make her a finalist and give her a chance to throw for bigger prizes. A neighbor back in Louisville owns a construction company and built her a practice target. The Walsh University coaching staff gave her free reign of the football closet when she wanted to practice — and practice she did. Things were especially hectic last week during Walsh’s finals week, but by Thursday she’d finished the semester and flown with her parents to Indianapolis. Last Friday, five contestants had a throw-off to narrow the field to two. She was one of the top two, advancing to Saturday night’s final at halftime of the Ohio State-Michigan State Big Ten Championship Game. It wasn’t until the game started, Brown said, that the size of the crowd and the magnitude of the moment got to her. She ignored her nerves and pushed them in, winning by a comfortable margin. She had no idea her opponent had struggled, but figured she’d won when the Brutus Buckeye mascot lifted her into the air and the Ohio State cheerleaders went wild. On Monday, she got a Facebook message from the man who was inside the mascot costume. She’d better get used to it. She got there by submitting a video detailing how she’d like to change the world, and hers is definitely now changed. When she’s cramming for finals week next December, she could be drinking from a Dr. Pepper can that includes her picture. "I’ll definitely use the money," Brown said. "I’m so grateful. I don’t know what else to say. We got treated like royalty, I won and I feel like everybody I know was watching. It’s just incredible. I can’t believe it’s real."